The following article was written by Brenda Andrews, Publisher of The New Journal & Guide. It was published in the historical, century old African American paper. The comments are her perceptions and observations based on a live interview. Any observations or clarifications I have will appear at the close of Ms Andrew's treatment. Many people today are aware of the Eastern religions, namely Buddhism, and some of their religious practices, especially meitation and chanting. It hasn’t always been that way, especially among African Americans who practice Christianity. Perhaps the popularity among Blacks of the martial arts and its focus on self-defense and inner discipline have helped take away some of the mystery. For internationally celebrated author Vernon Kitabu Turner, who was home grown in Portsmouth, Va., there has never been a conflict for him between his Christian roots and his attraction to Buddhist traditions. That despite the fact that these traditions were foreign in the 1950s African American southern environment into which he was born and reared. Buddhist philosophy defines happiness as an enlightened mind; suffering is caused by a distorted mind. So the spiritual quest to live happily in human form is linked to being enlightened about universal truths. Today, Turner, known popularly as Kitabu, the name he gave himself, awaits the publication of his fourth book that once again will deliver a theme that unites the life principles and teachings commonly associated with Christianity and Buddhism to tell of self empowerment and self renewal through spiritual transformation. 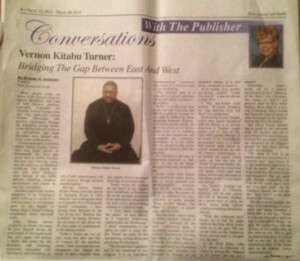 Having known Vernon Kitabu Turner since my arrival in Hampton Roads in 1982 when he was working part-time as a reporter for a Portsmouth weekly newspaper, I have always been intrigued by the "out of the box" thinking that is behind his books. Recently we sat down to talk about his 40 plus years of contributions to the literary world. Turner’s books are not an easy read, but they are full of wisdom for the spiritual seeker. Their messages are not transparent, but require the reader to delve beneath what may appear obvious for deeper meanings of universal truth. Turner insists his writings are not based in any religion be it Christianity or Buddhism but in the spiritual awakening of an individual to whom he or she truly is as a spiritual being residing in a physical body. “I write about awakening the mind,” he says simply, as if everyone understands intellectually the “awakening.” I admit unashamedly it has taken me years to grasp this. But Turner has spent his life interpreting, writing about, and practicing his messages. “This is a spiritual experience and is not connected to any religion. It is an individual transformational experience that results in a renewed mind or way of thinking. “The religious path is a collective (or group) approach, not an individual experience,” he explains. Turner is a Christian who is allowed into Christian and Buddhist environs because he succeeds in addressing those truths that transcend religions. Such truths include mainly the belief that divine power resides within each of us enabling us to do the exceptional and accomplish the seemingly miraculous. It is the belief that we can access that power through our mind to affect the physical. For Christians, the idea is expressed popularly in Phil. 4:13, “I can do all things through Christ who strengthens me.” Turner writes both fiction and non-fiction which allows him to merge personal and autobiographical accounts from his life with his creative genius to make his points. In 1975, he published his only collection of poetry entitled “Kung Fu-The Master: The Book of Kitabu.” A recent copy sold for $200.00. 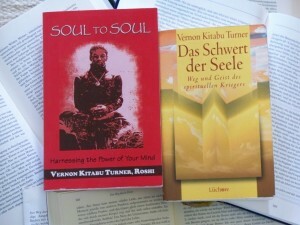 His first book was a work of fiction entitled “Secret of Freedom”, followed by his most well-known book, a non-fiction account of his life entitled “Soul Sword, The Way and Mind of a Zen Warrior.” After the 2nd edition sold out, it was purchased by a European company and recently was reissued in Europe as an expanded edition. It is also being distributed in America. Book number four, another non-fiction entitled “Under The Sword” is due for release in May 2012. A fifth non-fiction book entitled “Ki-asana: Bridging the Gap Between East and West” is in production. In reviewing Turner’s books, critics often appear fascinated with his affinity as an African American to Eastern Asiatic culture and its way of life. They often cite the influence on his works of his extraordinary documented antics as a black belt martial artist which he says he learned in one day and his superior qualifications as an Eastern zen master which confer on him the title of “Roshi” or spiritual teacher. He has zen students the world over and spends weeks each year doing lectures and seminars on the subject in the United States and abroad. Yet, Turner’s writings are heavily laced in Christian theology, and he also carries the title of Minister. Further, as a proud man of color, he never leaves home without wearing something identifiably African. “What the scriptures have taught me is that the same Spirit in the Holy Bible works today as in the past. We can accept Paul on the Damascus Road, but we want to relegate it to the past.” In the Holy Bible, John 1:16 speaks to followers of Christ as having the “fullness of His power” and not just a measure. Essentially, Turner’s books call for a spiritual transformation by a “renewing of the mind”. For Christians, this means to believe and practice what the Holy Bible teaches, there must be an new way of thinking. This is a truth that forms the basis of much of what was taught by the Apostle Paul in the New Testament. artist and being awarded a black belt in one day. “There is a secular way and a spiritual way to accomplish things,” he says. 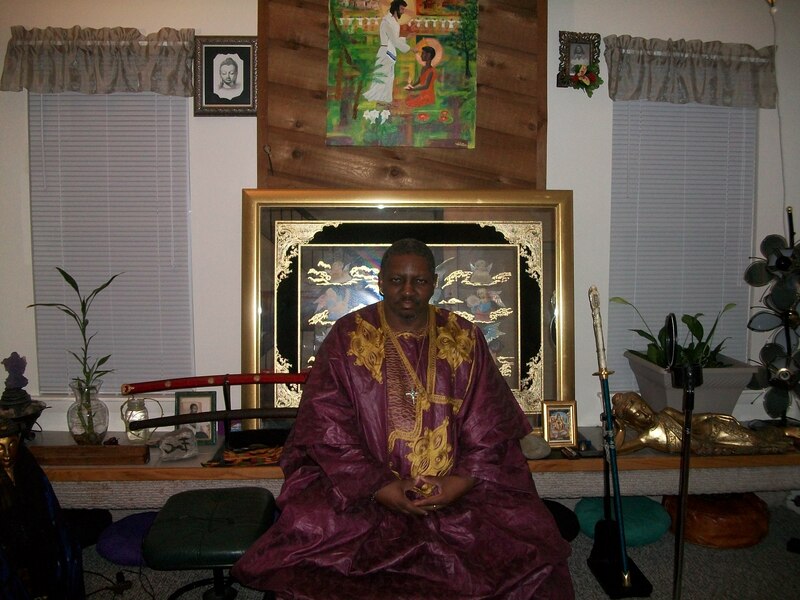 By connecting with the divinity of God within him, he tells how he was able to gain the martial arts skills of a black belt in one day. He tells this miraculous story in his books and on his website. (www.soulsword.com) Today, Turner is a long way from his Portsmouth upbringing. although he lives a short distance away in its sister city, Virginia Beach. He says he’s always thought differently than most people he was destined to look like. In fact, he says his mother called him a “peculiar” child, and for much of his youth growing up, he spent large blocks of time alone and silent. “For the first 13 years,” he says, “I rarely spoke unless I was spoken to.” At 14, he determined for himself that he was meant to be a “loner”. In this state, he says he could observe and see things around him as they were, and not as the people around him were interpreting and giving meaning for him. “There was something about the silence that appealed to me,” he remembers. “I felt a peace come over me,” he says. There at the park on the bench was a zen master who greeted him. “He knew who I was; I felt at peace,” Turner recalls. He would become a student of the zen master who gave him the book, “Three Pillars of Zen” as his instructional manual. Under the zen master, the eager young seeker of truth learned much, including how to sit in the lotus position in one day. It is a position he still masters 43 years later. “I vowed to help human souls no matter how different,” says Turner about the deep influence of this relationship with his teacher. It became a vow he has sought to keep through his literary and teaching careers. “My books allow me to teach on surrendering ego and swallowing up fear to do things untaught,” he says. The same spirit that led him to his zen master leads him today, he says. “I have spent my whole life developing a ‘mind like water’.” Visit his website and you will view videos demonstrating his martial arts abilities, his zen lectures. and regular stories on everyday topical issues and human responsibilities.